Santa Monica Place is one of the latest enclosed malls to meet with the grim reaper: the place is scheduled to close up shop at the end of this month! Socal Labelscarrers: act fast if you want a chance to say goodbye! Santa Monica Place is a three-level, 570,000 square foot shopping mall located in the heart of downtown Santa Monica, California, just a few blocks from the beach and the infamous Santa Monica Pier. 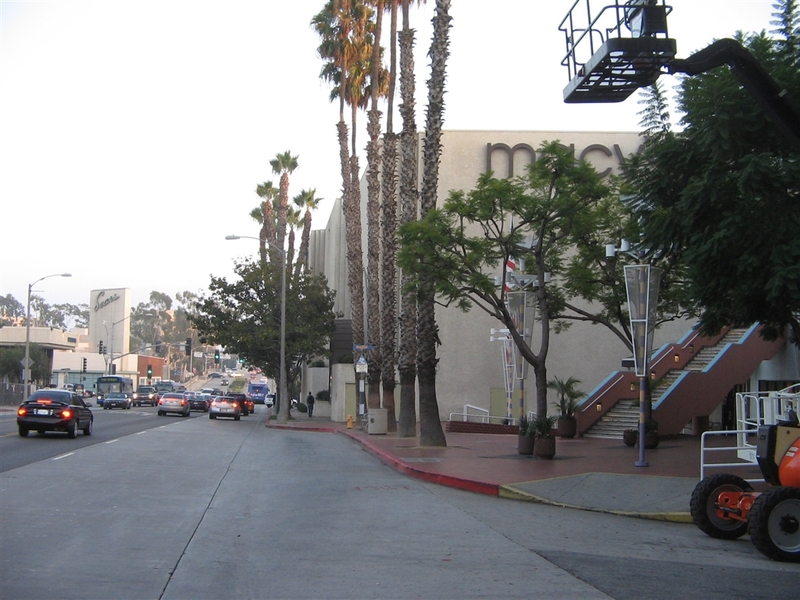 The mall, which opened in 1980, sits at the southernmost end of Santa Monica’s bustling third street shopping district, which is a lively and vibrant downtown pedestrian mall (and one of the best pedestrian-friendly areas in all of Los Angeles, really). Somewhat surprisingly, the mall was designed by renown architect Frank Gehry with Victor Gruen Associates, giving it a more stunning architectural pedigree than most centers. Unfortunately, the vast majority of the interior architecture at the 120-store mall is considerably blander than the names of those starchitects might suggest. 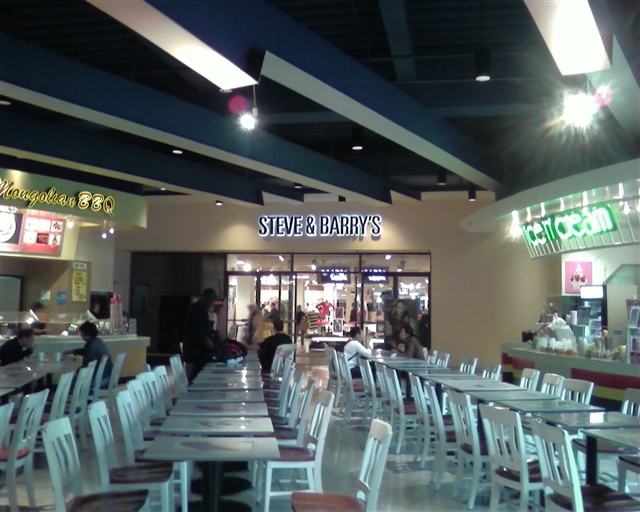 The mall has two anchors: a large Macy’s and a former Robinsons-May which closed in 2006 and was partially replaced by a new Steve & Barry’s store in 2007. 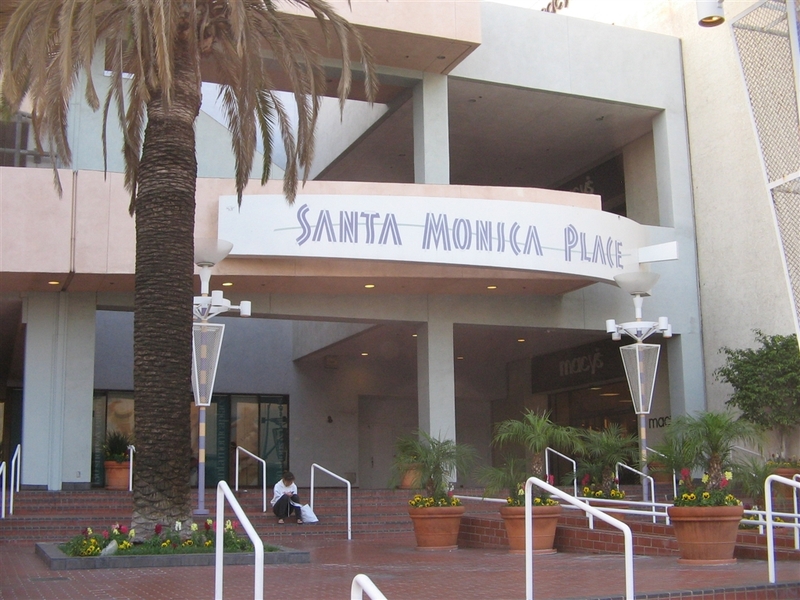 Santa Monica Place is most famous for cameos in movies and television; most notably appearing in Beverly Hills: 90210, Terminator 2: Judgment Day, and also as the exterior of the “Ridgemont Mall” in Fast Times at Ridgemont High (the interiors were at the now-deceased Sherman Oaks Galleria). The mall, which was less than 50% occupied by 2007, apparently never turned a profit. 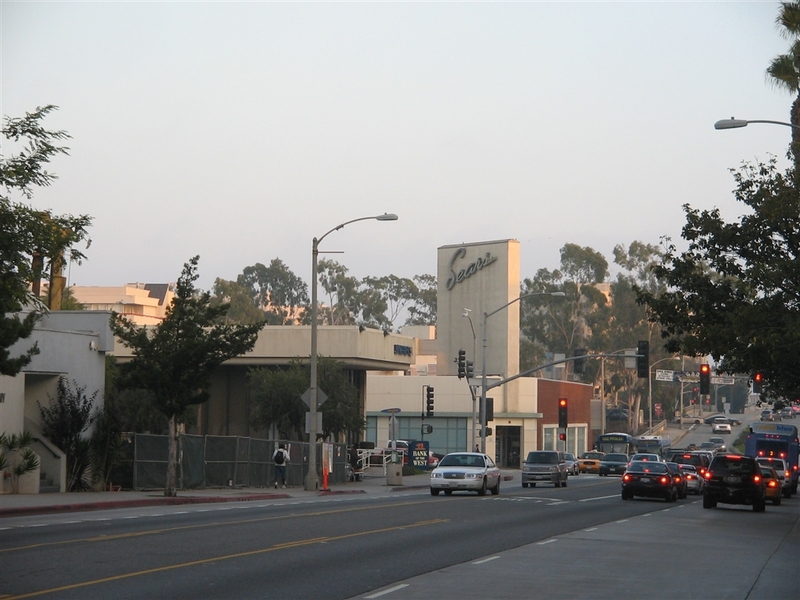 The Macerich Companies purchased the ailing center in 1999 and first floated a redevelopment plan in 2004 that would’ve replaced it with a large complex of offices, condominiums, and retail. The plan was met with opposition and scrapped. In 2007, Macerich proposed a more modest redevelopment plan that would tear the roof off the current center and convert it into an outdoor mall to anchor the southern end of the Third Street Mall. This plan is now moving forward and the mall was in the process of clearing out most of the tenants when these photos were taken in November 2007. 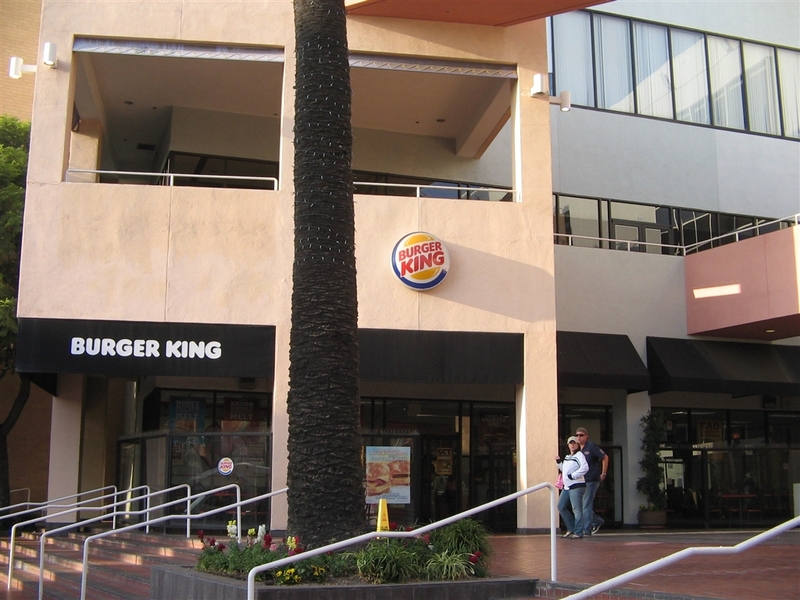 Santa Monica Place’s prime location is probably a big part of the reason this place is going to come down. Given the lively streetscape and near-perfect weather, it seems silly to force people inside to shop, when a superblock component to the existing downtown streetscape would probably be more successful. Plus, California has many fully outdoor “malls,” and it seems the plan is to turn good ol’ Santa Monica Place into one of them. 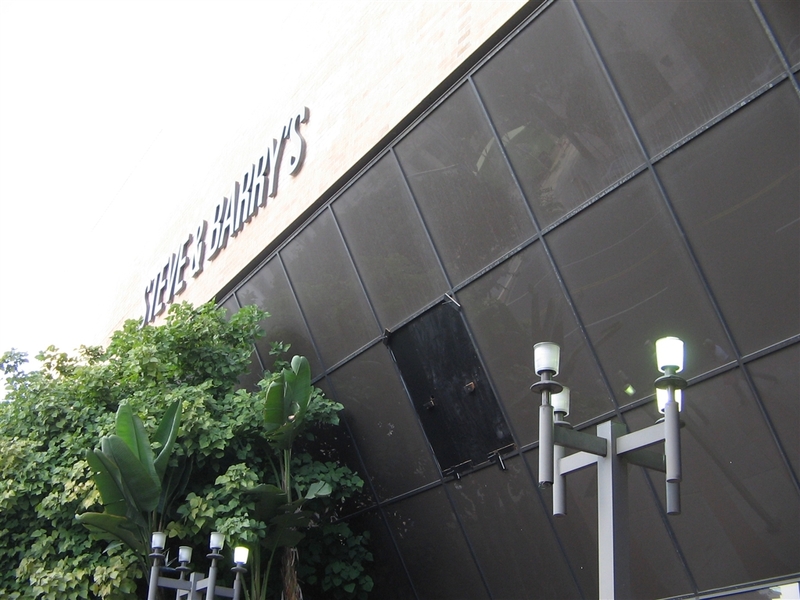 There’s another retail oddity just behind Santa Monica Place. 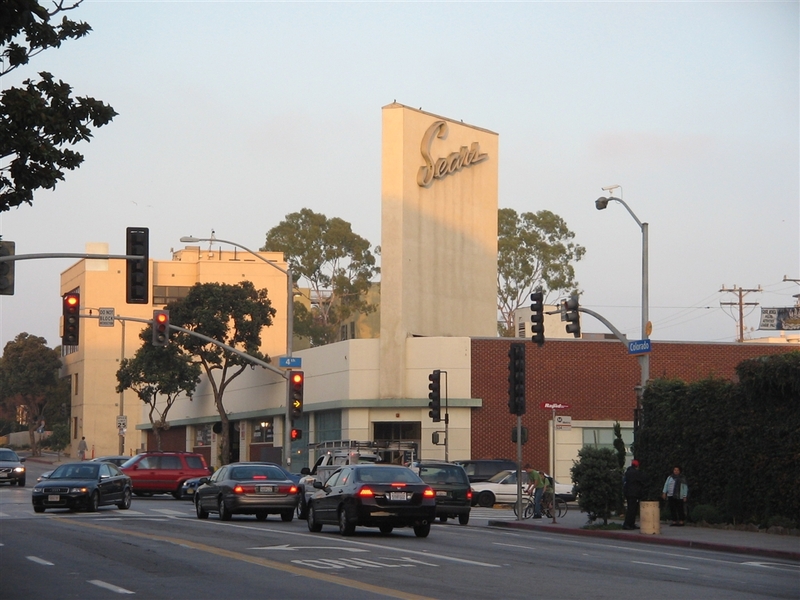 This 1945 vintage Sears store is not part of the mall itself, but I thought it epitomized classic Art Deco California cool, and how Sears utilized some ancient logos (or simply just kept them up?) Either way, a neat find. Cool. Why’d it fail, though? @Jonah Norason, I live near this mall and am 12 years old. i remember going to this mall with my Grandma who worked for years at the gift wrapping center in the old robinsons-may. 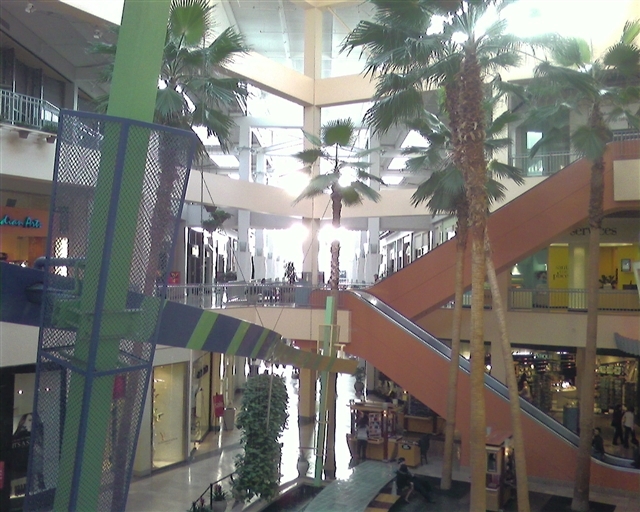 overall, this was a really bad mall with stores that were less than useful and entertaining. yeah.although i remember going into a really cool candy store! The Sears store is the real deal. Designed by famed architect Roland Crawford and opened in 1945. The mall is closing on the 31st permanently. The third floor of the mall was pretty much always dead. The only activity that ever happened was at the food court that was located at the main entry (top pic). One neat labelscar (which you can barely see on the main top pic) is located on the Robinsons-May store. Its an old Robinsons labelscar (1980-1992, when it merged with May Company). The Macys store was a former Broadway department store that has not been remodeled since the merger, and still looks like an old Broadway store inside. The mall is going to be opened up in the new incarnation. 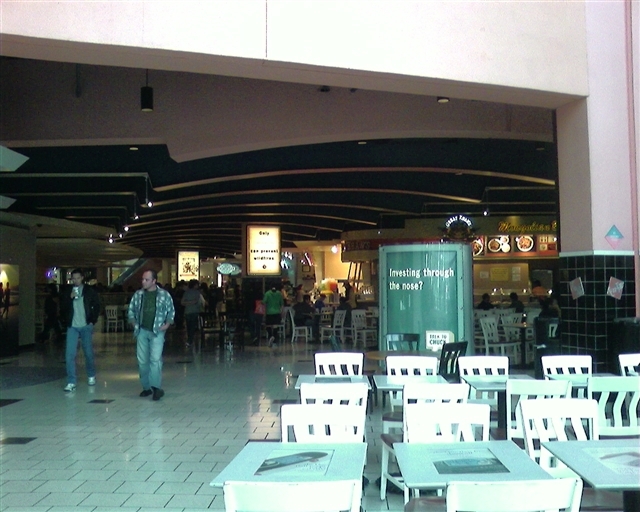 The food court is to be located on the third floor overlooking the ocean, and Macys is going to stay open. They are looking for a 2nd anchor to fill the Robinsons-May spot. 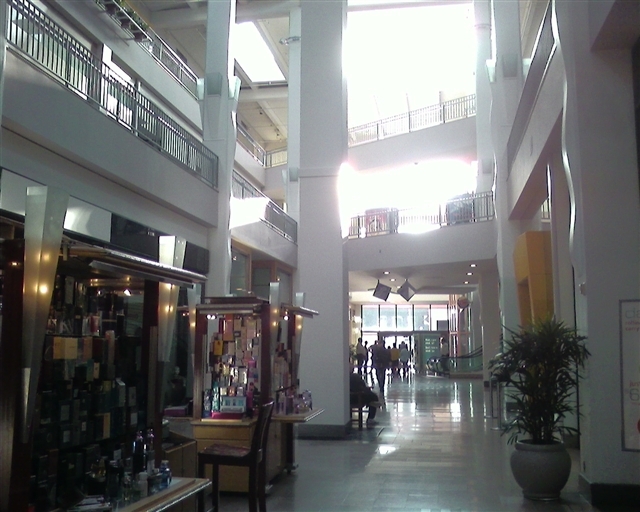 All the big chain stores once in the mall (Gap, Foot Locker, Champs, etc) all moved out to the Promenade. 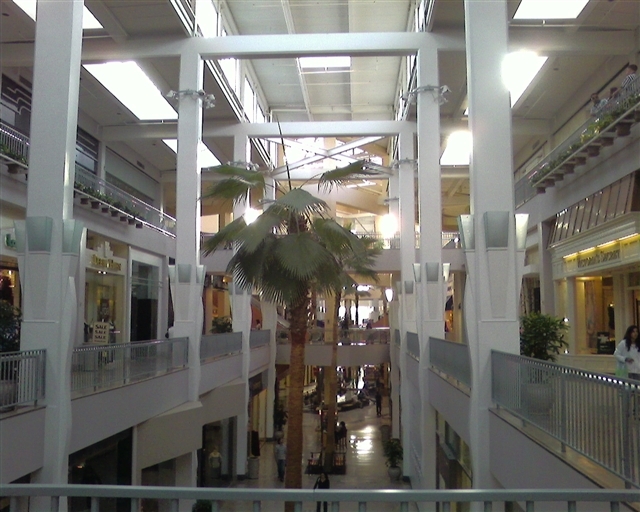 All that glass…..definitly a mall out of the ’80s. You struck gold with that Sears though. Nice find! 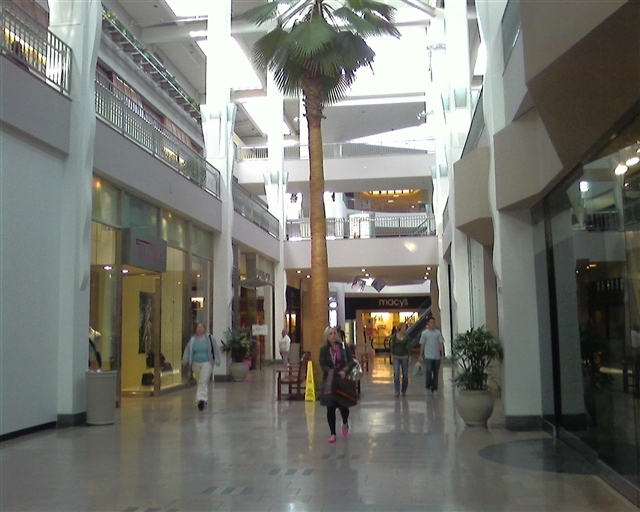 After visiting L.A. a few years ago & Santa Monica in particular i realized that an enclosed mall is not nessessary there. Open it to the rest of the promanade & include a new megaplex theatre., AMC has been wanting to replace it’s 4 & 7 screen locations along 3rd street for about a year or more. Now they can do just that, the location is unbeatable. I agree that this mall is largely unnecessary. The downtown is such a thriving area and the mall doesn’t effectively feed off of the success of the promenade, plus the weather there is just so perfect. LA is full of fully outdoor “malls” (which in almost every other way look like any indoor mall would, just with no roof) that it makes sense to convert this one to be one of those. It would probably flow better with the rest of the streetscape and be much more of an attractive asset that way. The key here is that Santa Monica Place is NOW largely unnecessary. When it opened in 1980, downtown Santa Monica was deader-than-dead. The city had closed off Third Street and turned it into a pedestrian mall following the Fresno model. Basically only two things kept the old pedestrian mall going–Hennessey and Ingalls Bookstore (great architectural bookstore) and the Vidal Sassoon School. Santa Monica Place thrived (I don’t know about its profitablility but it was always busy), but Third Street was dead. 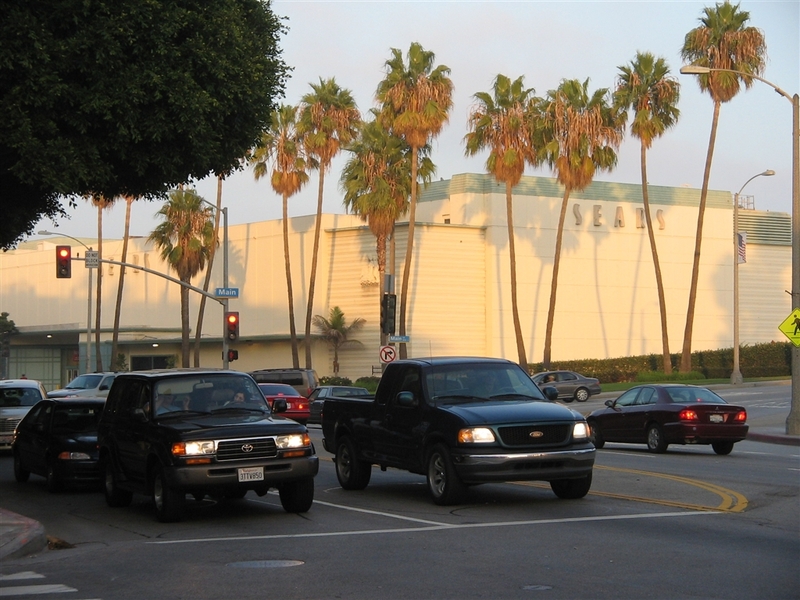 Then in the late 1980s, Santa Monica partially reopened up Third Street to traffic, relandscaped the street, and convinced a large movie theater chain to open up a complex. And the Third Street Promenade began. 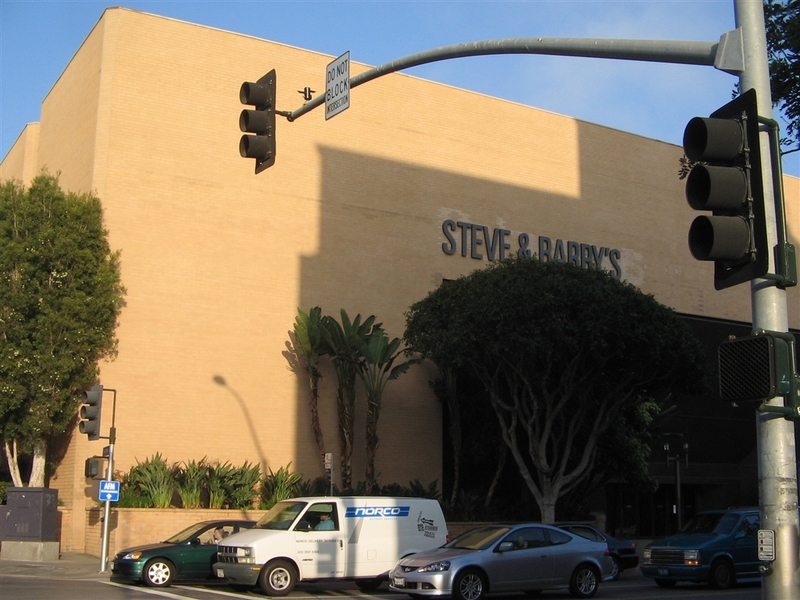 To help fund USC architecture school, I worked at that Sears in 1988-1989 unloading trucks for the catalog department. They had changed nothing in that store back then from when it had opened. I’ve always wondered what it looked liked now. Thanks for the current pix of the store. I’m glad it looks basically the same and will have better access to the Promenade. When are you going to do a post on White Plains? I could help you out. back to SMP if AMC is building new theatres all over the L. A. area why not in an area as popular as Santa Monica? The former Robinson’s May would be the most logical place for it. 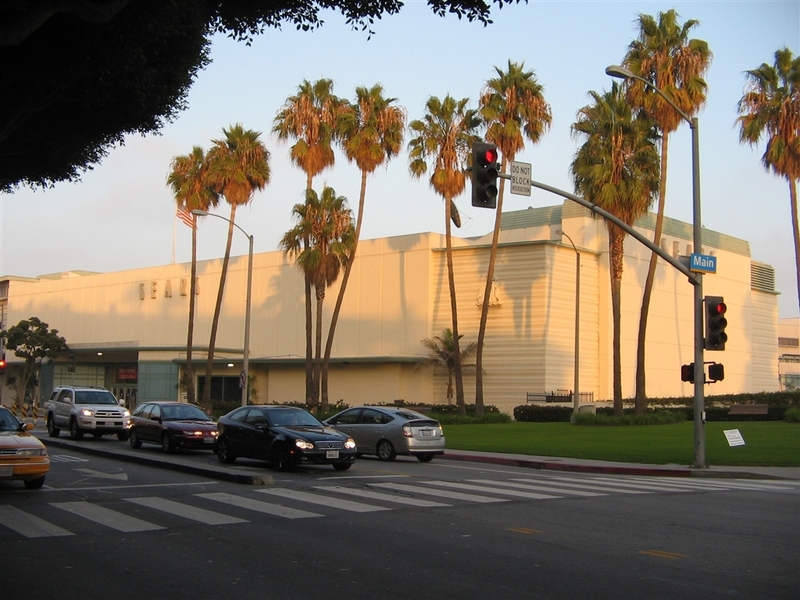 I used to shop with my grandmother at the old Santa Monica Mall, which is what 3rd Street was known in its pre-Promenade days. I could never get into the Promenade because I remember it as the old mall. I guess it’s the memories of childhood the supercede wanting to shop at The Gap and Borders (or whatever stores are there now). 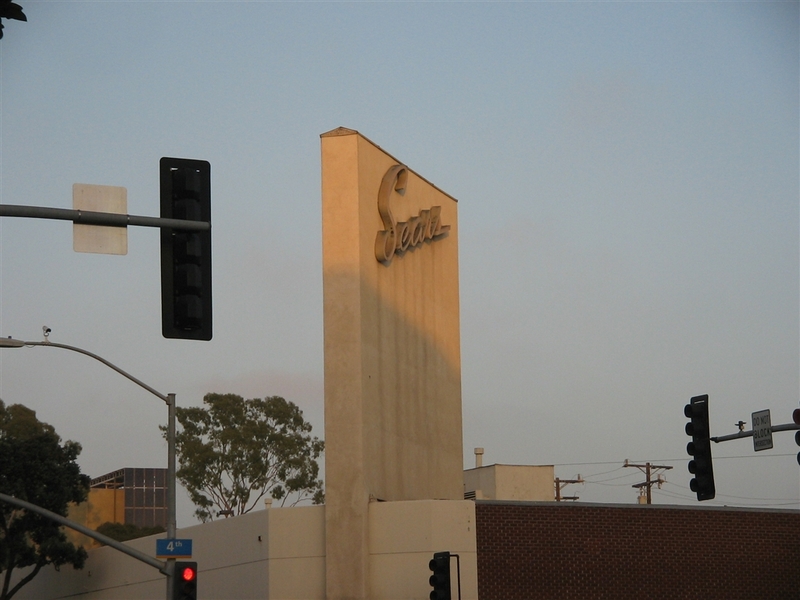 That Sears is a landmark, clearly visible from the 10 Freeway as it merges with PCH. The Sears Auto Center, which is the standalone building with the script sign on the pylon is slated to become a station for the Expo line if it ever gets extended to Santa Monica. There’s a cool little auto tunnel that goes under 4th Street that connects the auto center’s parking lot with the main store’s parking lot. I just realized something, the westside of L. A. is home to no less than 3 retail real estate developers. 1. macerich 2. westfield u.s. corporate offices 3. caruso affiliated. The last one most people would not know because all of there project are lifestyle centers in california. However he is no less very active in retail developement. Amazing, it must be something in the water. Rick Caruso is his full name. The old Santa Monica promenade is also featured in Pee Wee’s Big adventure. I went there shortly after the movie, and yeah it was very very dead, but the store fronts were cool. 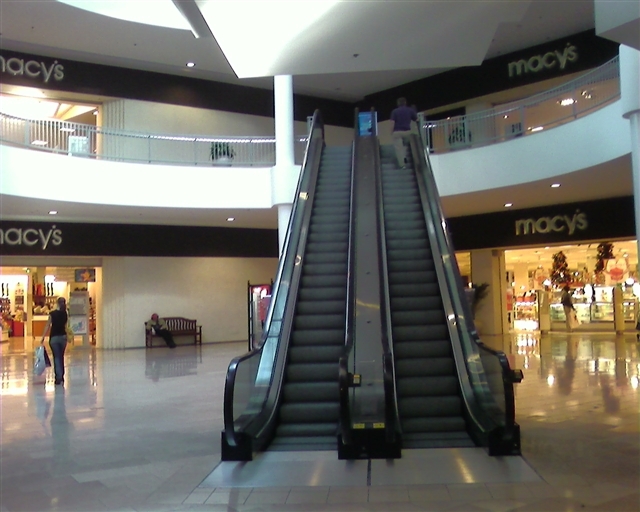 As for the mall, the escalator layout is really annoying, 3 stories is overkill (for the area), and with all that action outside, why would you come inside? I was there 2 weeks ago and although a lot of stores have already left, there were a number of them still there. And wasn’t that Dave an Barry’s only opened up a few months ago? I think it moved up from the Fox Hills mall? And man it is scary in there. They just moved in without fixing anything from the Macy’s move out. Very weird. 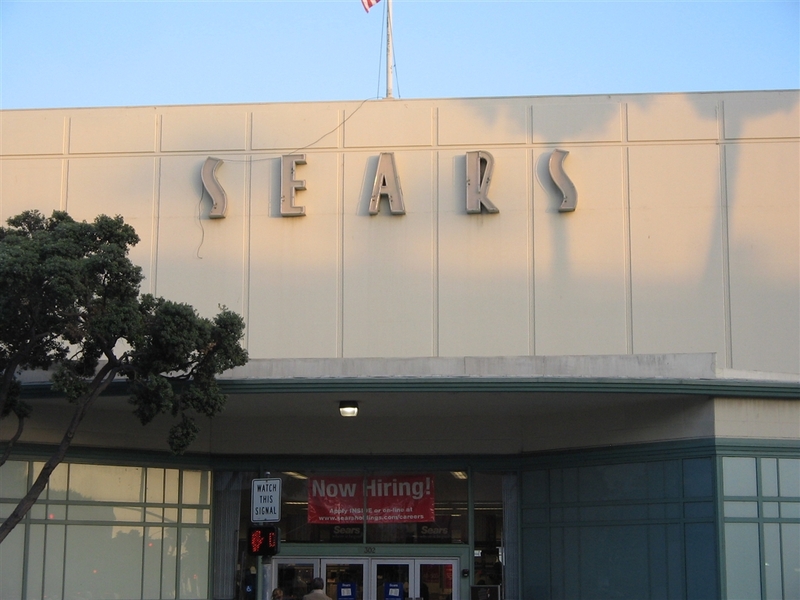 The Sears is very vintage and in my experience very depressing. In another city it would be cool and adventurous but here it just seems sad and old. That is sad… When this mall first opened, it was the epitome of flash and glitz by one of American’s most notable architects. Guess it takes more than architecture to motivate people to shop. I’m glad you immortalized it with your photos. I have an Architecture magazine with this mall featured in it. Guess I’ll laminate it, now. Ah, Santa Monica, one of California’s most overpriced cities. You have to admit, the weather is darn near perfect. Who’d need a roof on a mall there? Nevertheless, I’m sorry to see it go. This mall is soooo 80’s. I bet when it was opened in 1980, it was considered state of the art and the future of shopping with the dawn of the new decade. one of the many malls of the 70’s and 80’s indoor mall boom when the indoor mall was the thing and no one would have ever thought that they would ever be in danger of extinction. It is a shame that it has to go, multi level malls with all the glass, and painted beams and pillars are always my favorite types of malls. I was always fascinated by the big multi level super structure type malls. I never saw any malls like this until I was older because all the malls in my city as a kid were single level. 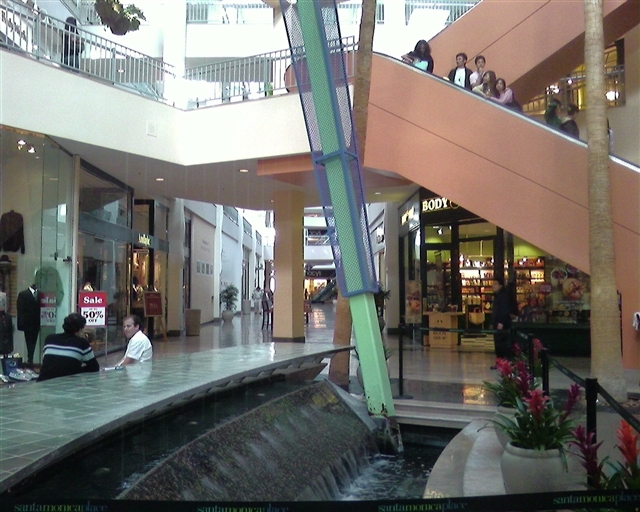 This kind of mall was the kind of mall on television and movies, almost like it was not real. It also looks very bright and fun place too. Plain vanilla shell reports that SMP is closed for good. The new design brings the 3rd street prominade into a complete shopping district by opening the mall to the outdoors. That’s funny, I was just there in December and it was packed with a decent occupancy rate. They must have kicked everyone out fast, but I’m sure they knew it was coming. Seems the mall closed for good on January 31, 2008.
http://www.santamonicaplace.com/assets/santamonicaplace/SMP_Retailers.pdf is a list of the displaced stores and their “new locations” – some of which are 40 miles away in southern Orange County. At least many of them appear to have gone outside to 3rd Street and the neighboring downtown area. At least this is one of the de-malling redevelopments I can’t disagree with. Having it there as an enclosed mall was neat, but to fit in with the retail climate of downtown Santa Monica considering the success/dominance of Third Street Promenade and the other outdoor amenities (the ocean, beach, pier, etc.) having this be outdoor makes perfect sense. That said, I’m still sad to see another one bite the dust. Mmmm…Jamie’s right. This is the cool kind of malls. It’s sort of like pizza…New York style and California style. Isn’t that the opposite of pizza, though? I knew I recognized this mall from somewhere(albeit a movie)! Enjoyed reading the write-up on SMP, and the pics. Speaking of Caldor’s comment about this mall being in a very successful street shopping area, this mall reminds me a little bit on the entry on City Place Mall in Silver Springs, MD, as I recall it was also in a downtown shopping area that later became successful, but didn’t succeed in drawing many shoppers inside. And (probably)a stupid question I’ll ask about downtown Santa Monica, was its downtown not as successful back when this mall opened in the 1980s, compared to today? Also have to agree with Prange Way too about this de-malling project one that makes sense to me and isn’t a bad idea for SMP, instead of just other bland de-malling projects I’ve read about that only turn former malls into a lifestyle center, or a big box center/’power center’. I may be alone on this, but I personally don’t see what is so stunning about the architecture of this mall, am I missing something? It looks quite old and industrial, I can’t see the beauty of it. I’ve never been to it, so maybe it’s different in person. 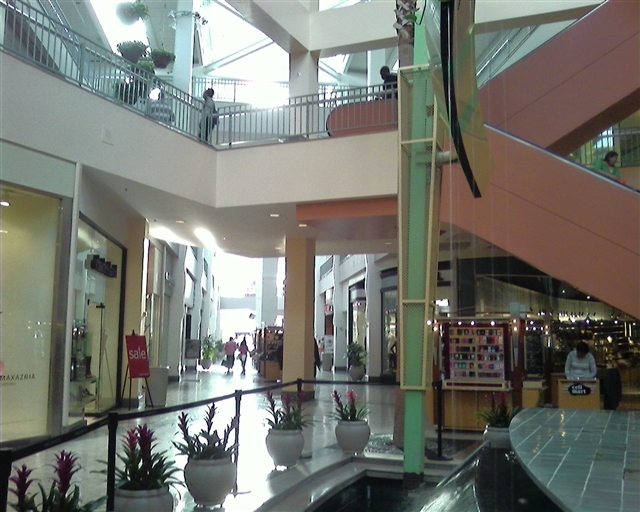 Our Twelve Oaks Mall where I live was built in 1977, and features a stunning interior with amazing ceilings. Its 1980 opening was marred by a fire at the Robinson’s building which it nearly destroyed, killing one person who was either a security guard or a janitor. I don’t think the cause was ever determined, but it was the biggest fire in Santa Monica’s history. As a result, Robinson’s grand opening was pushed to August 1981. I believe that Gehry’s firm was only responsible for the makeover 15 or so years ago. Interestingly, the north entrance was expanded to feed customers into the newly opened Promenade. It ended up the other way around. The need for a complete redevelopment became clear years ago, and the mall started bleeding tenants. It may have appeared full recently, but the place really was Potemkin Village consisting largely of false storefronts. Plus, the parking was a nightmare. Oh, and the escalators were terrible. Yes, right before the “Third Street Promenade” opened in 1989, that strip was deader than dead. Fast forward a few years and it’s getting some of the highest rents in California, some of them higher than Rodeo Drive in Beverly Hills! Rents on Third Street were so high that Disney couldn’t stay there. It went from empty stores with a few independents, to chains moving in, to more upscale chains moving in, to high-end fashion boutiques moving in, which where it is right now. In 1989, the SMP mall was the only bright spot in that area. Now, forget about it, it’s Beverly Hills Junior. I am the grandson of Roland Crawford and am interested if any readers are aware of other buildings he designed. PR Newswire reports that Nordstrom has signed a letter of intent to open a 3-level 122,000 square foot store at Santa Monica Place. The story is on Plain Vanilla Shell today, along with a brief discription of Maceerich’s plans for the 550,000 plus square foot center. That is exactly the shot in the arm they needed, now how about adding a new AMC theatre complex to replace the 4 & 7 screen locations on 3rd street. I went to this mall when I visited Santa Monica in the summer of 1991. It seemed to be booming back then. I am discovering through this web site that a huge % of the malls I visited in the 70s-90s are now closed or a shadow of their former selves. Bloomingdales is replacing Macy’s at the mall. The Bloomingdales at Santa Monica will be based on the smaller SOHO store concept. I worked on the original construction of the Santa Monica Place…Frank Gehry did indeed design the oroiginal mall, Gruen Associates did the Construction documents and the Construction Administration. (Victor Gruen was the ‘grandfather’ of the mixed-use center, a.k.a Shopping Center) and they were added to the team to get the project built since Gehry’s office has always been high on design, but not so much common construction practices. The demise of SMP is a testament to exactly how dated & disposable the work of Gehry is. His work (IMO) is a classic case of the “emperor’s new clothes.” Because they contain no elements of classicism, Walt Disney Concert Hall and the Guggenheim museum in Bilbao currently touted by architecture critics as “groundbreaking & innovative” within a few decades will be declared as tacky & laughable eyesores— an exercise in architectural egotistical self-indulgence. 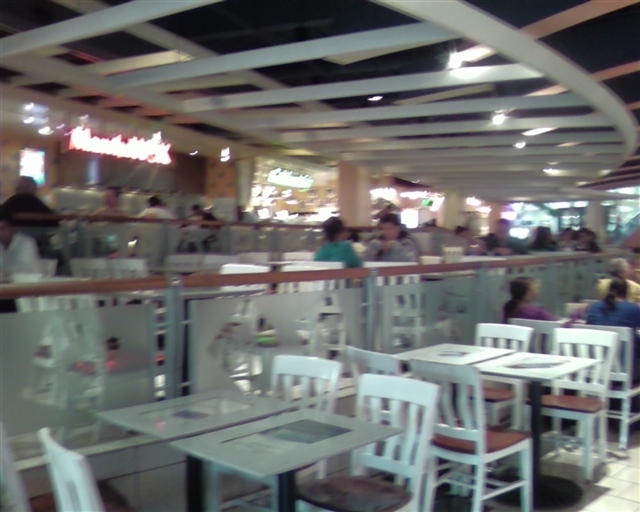 While I was working near SMP back in the late 90s, I noticed even then that the only places that did a bang up business were the restaurants in the Food Court. Workers in the area flocked to the reasonably priced food outlets because the sit-down places along the Promenade were ridiculously overpriced for the average office/retail worker. SMP anchors like Nordstrom & Bloomingdale’s will face stiff competition from already competitive centers like The Grove, Beverly Center, Century City (all of which are within blocks of each other) and Westside Pavilion. However, being only 2 blocks from the ocean, Santa Monica will always have an appeal for LA tourists. its funny the only time I have ever been in SMP was to walk to and from the parking garages! as mentioned, the only place that was ever hopping was the food court. The Santa Monica Place is an incredible business. I bring my kids here all the time, they love it and the massiveness of the building. 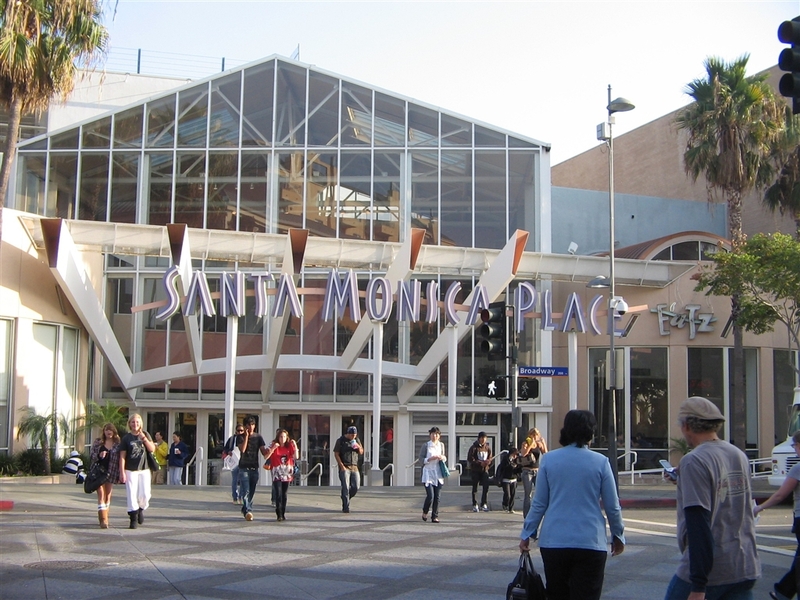 April 26, 2010 –Retailers specializing in clothing, jewelry, fragrances and luggage are among the 14 tenants Macerich announced this week will be included at Santa Monica Place, the mall being rebuilt at the end of the Third Street Promenade. Santa Monica Place is scheduled to reopen on Aug. 6. Among the new additions to the roster are Betsey Johnson, a female clothing designer known for her elaborate designs; Barneys Co-Op, a boutique-sized version of the New York department store with a focus on young people and White House¦Black Market, a boutique that specializes in women’s clothing in shades of white and black. fragrance retailer L’Occitane, Bird Pick Tea & HerbBrazilian sunglasses company Chilli Beans, jewelers Tous and Sea of Silver, California clothing seller Foreign Exchange, Kensington Luggage and GNC. Also announced this week, Love Culture will open a larger, 10,069-square-foot store rather than the 7,500-square-foot space originally planned. The 550,000-square-foot renovated Santa Monica Place will feature Bloomingdale’s and Nordstrom as its anchor stores. Other tenants will include Nike, CB2 and Burberry. The new design features a round open-air plaza with wide passageways that connect the mall to the Promenade to the north and the Civic Center to the south. Last month, Macerich announced the rooftop food court would include a gourmet market offering “high quality artisan, organic” food. Mall officials said it would be similar to the Ferry Building in San Francisco and the Chelsea Market in New York. Called the Market at Santa Monica Place, it will open toward the end of this year or early next year. What was once an enclosed, fortress-like structure reopens to the public after a two-year facelift. Thousands flock to see the now-airy, upscale center with views of the Pacific. Two years and $265 million later, Santa Monica Place reopened Friday with thousands of shoppers pouring in to get a first look at the newly remodeled shopping center. By the time Walters arrived at 8 a.m., two hours before the mall opened, hordes of shoppers were already lined up in a scene reminiscent of Black Friday crowds on the day after Thanksgiving. Retail industry experts are calling it the most ambitious shopping center opening this year. They have lauded the modern, airy design of the new 524,000-square-foot mall, which features floor-to-ceiling glass walls in some sections, an upscale tenant lineup that includes new anchors Bloomingdale’s and Nordstrom, and a third floor dedicated to an array of food options. Previously an enclosed, fortress-like structure designed more than three decades ago by architect Frank Gehry, Santa Monica Place has been converted to a three-story, open-air shopping center with views of the Pacific Ocean, Santa Monica Mountains and Santa Monica Pier. Shortly after 10 a.m. Art Coppola, chief executive of mall owner Macerich, took to a stage set up in the center plaza and welcomed shoppers as hundreds of brown-and-white beach balls were tossed from the upper levels. Most of the mall’s retail spaces opened their doors Friday, with many offering free products, hosting special guests and doing product demonstrations. The Disney Store gave away Mickey Mouse ears to the first 500 guests in line; Juicy Couture gave gift cards to the first 200 guests and had male models passing out candy at the door; and White House Black Market handed out coupons for 20% discounts. Months of hype drew a diverse and eclectic crowd to the mall. Shoppers included the high-heeled, the heavily tattooed, families with strollers, grandmothers in sweatpants, local residents and international tourists. Nina Withrington, 37, a physical therapist from West Los Angeles, arrived before 9 a.m. with her mother, Anita, 66. The two weren’t looking for anything in particular — the appeal was in the hullabaloo and in the potential for “free stuff,” Withrington said. 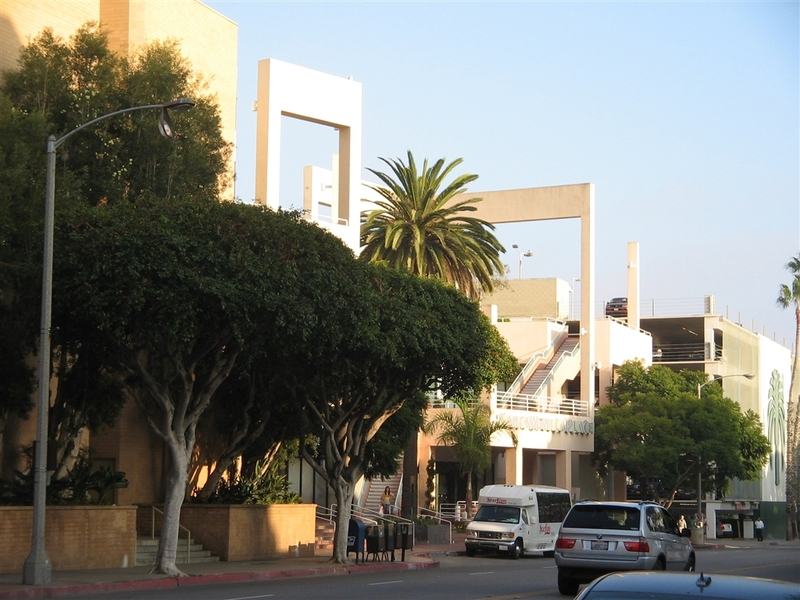 Macerich had once hoped to demolish Santa Monica Place and replace it with a 10-acre complex of high-rise condominiums, shops and offices with underground parking. The company scrapped those plans in 2006 after being hit with a wave of community opposition from critics who said it would overwhelm the city’s downtown. 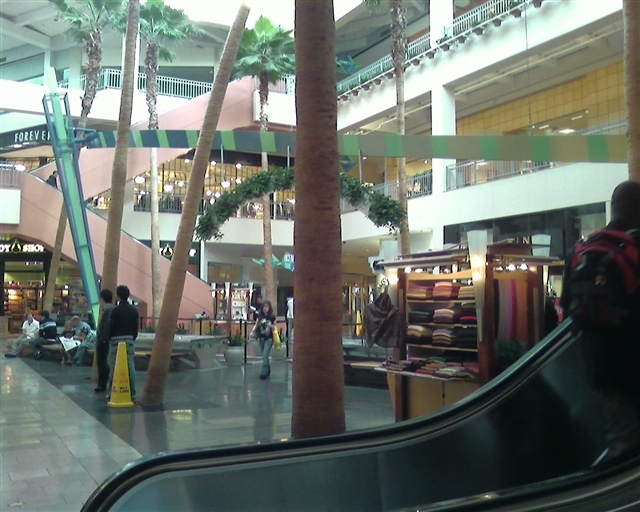 Instead, the Santa Monica-based company decided to revamp the outdated mall and moved it in an upscale direction. Besides its high-end anchors, Santa Monica Place is also home to Tiffany & Co., Louis Vuitton and Burberry stores. But the shopping center’s highbrow slant could be a turnoff for consumers who continue to scrimp on discretionary purchases. “It looks like it’s going to be really fancy and not the kind of stores I’d go to,” he said. In an interview Friday, Macerich’s Coppola said he was confident that shoppers from Malibu to Manhattan Beach as well as international tourists would continue to flock to the mall well after opening day. Before the remodel, the mall’s tenants grossed an average of $350 to $400 per square foot annually, far less than the estimated $1,000 that retailers at the adjacent Third Street Promenade were pulling in, he said. But with its new lineup of tenants plus an array of food choices — including six chef-driven restaurants and 10 fast-casual concepts — the mall expects a huge boost in foot traffic and business. The parking and congestion in the area is absolutely unbearable. Luckily I’m a bike ride or even a walk away. However, if and when I don’t want to plan that walk or ride and just drive in and park, it’s just not pleasant. It’s unruly. It’s disappointing. Life Is Such A Sweet Insanity. » Christmas. Question? When it was Robinsons-May was were the only two floors open? 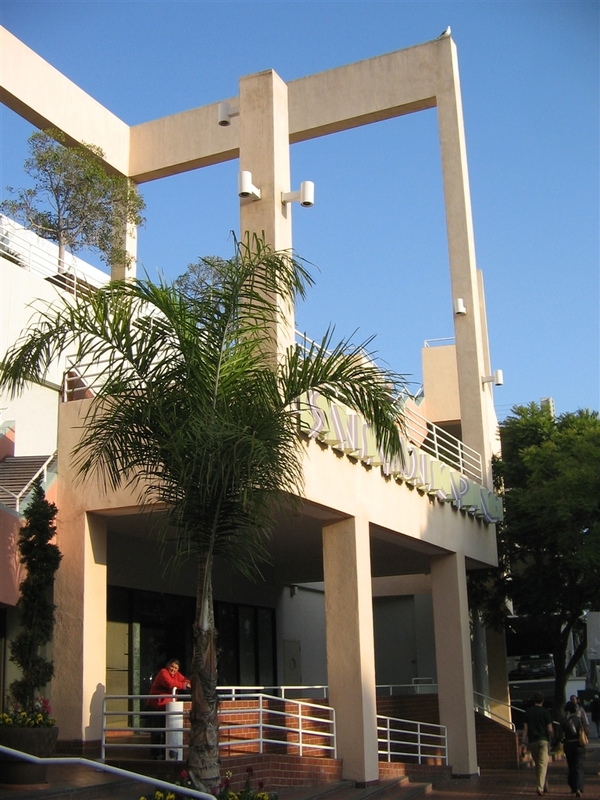 I lived in Santa Monica for 12 years and worked for a marketing firm inside SMP. While it is true that the mall was very dated and tired, the newest incarnation has a charmless, cold feel to it. It reminds me of going to a flashy Vegas attraction. The developers built a place that caters to younger, hipper demographic with even pricier stores and restaurants, each with their own entrance. The construction values lend a cold, sterile, trendy, rushed quality. Seeing that Santa Monica has a major homeless problem, they obviously wanted to keep the “public” from hanging out there. SANTA MONICA, Calif., Jan. 14, 2014 /PRNewswire/ — Los Angeles-based ArcLight Cinemas and Santa Monica-based Macerich (NYSE: MAC), one of the nation’s leading shopping center owners and operators, today announced a new 14-screen ArcLight Cinemas theater will open in mid-2015 at Santa Monica Place, the award-winning, open-air shopping and dining destination located next to Third Street Promenade and just two blocks from the beach. The new theater will bring ArcLight’s thoughtful, high-quality approach to movie-going to a community that is home to many entertainment companies but has lacked a state-of-the-art movie theater. The new ArcLight Cinemas will add a premium movie experience to the third level, view-oriented Dining Deck. The one-of-a-kind Santa Monica Place is home to Bloomingdale’s, Nordstrom, Louis Vuitton, Tiffany & Co., Burberry Brit, Emporio Armani, CB2, Nike and dozens of other exciting specialty stores and an inspired collection of food and restaurant experiences. For more than a decade, ArcLight Cinemas has redefined the movie-going experience in the greater Los Angeles area. ArcLight Santa Monica will feature the signature amenities that movie-lovers enjoy and have come to expect from ArcLight, including all reserved seating, a commercial-free environment, unique programming, and black box auditoriums with extra-wide stadium seats and state-of-the-art sight and sound. ArcLight Santa Monica will include a full bar, cafe and concessions with favorite items such as ArcLight’s famous caramel popcorn and chicken sausage baguettes. Guests 21-years and over can enjoy wine, beer and cocktails in the designated 21+ lounge and during select screenings. ArcLight’s popular membership program allows hundreds of thousands of L.A. movie-goers to stay connected to all ArcLight has to offer, both in theater and on-line. For ArcLight, today’s Santa Monica Place announcement comes on the heels of the groundbreaking ceremony for the company’s first Midwest location in Chicago, opening in 2015, and construction for ArcLight’s first East Coast location in Bethesda, Maryland, opening in 2014. 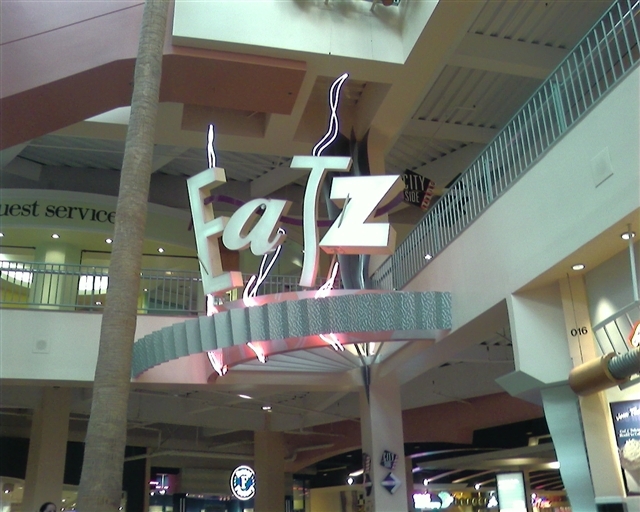 I grew up going to this mall. I mean literally was a baby in a stroller in the early nineties coming to this mall very often. I have so many memories there. Oh the nostalgia. I really miss the eighties/nineties. Remember the cool gadgets brookstone had twenty years ago? Now they’re all electronic and boring. There was a certain store either next to brookstone or the other side which was for kids. It was sort of space themed and had all sorts of cool telescopes and things. I’d really like to know the name of that store. I also remember a looney tunes store on the second floor and I remember meeting Tom Hanks at a luggage store in like 2001. I lived and worked in Santa Monica for many years. I’ve been to both the mall and Sears many times. I bought a three piece pin cord suit at Sears in 1978. I worked within walking distance of the mall for about five years shortly after it opened. I would sometimes go to the food court for lunch. I once bought a set of Revere Ware at the Robinson’s.